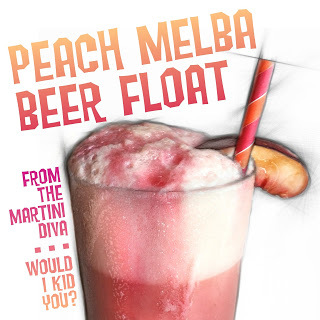 National Peach Melba Day is January 13th. Peach Melba is a classic dessert dish that consists of vanilla ice cream, topped with a peach half, drenched in raspberry puree and garnished with slivered almonds. 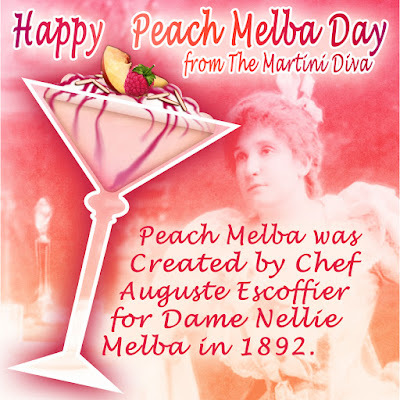 The very first Peach Melba was created in 1892 by famed chef Auguste Escoffier as a special dessert for a dinner party given by the Duke of Orléans. The party was in honor of Nellie Melba, the Australian soprano who was being lauded for her performance in Wagner's Lohengrin at Covent Garden. Since a swan was featured in the opera, Escoffier displayed the desert by having the Peach Melba being cradled in a swan ice sculpture. 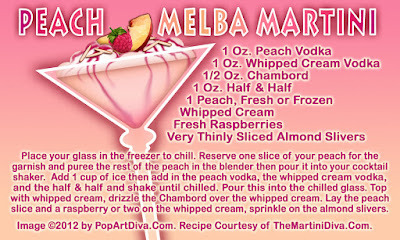 This original Peach Melba did not have the raspberry puree, being garnished instead by spun sugar. The raspberries made their appearance in 1900 when Escoffier again presented the Peach Melba for the opening of the Carlton Hotel, this time with the raspberry puree and slivered almonds. Interestingly, Ms. Melba, like most divas of the day was afraid of eating ice cream for fear the extreme cold would damage her vocal chords. However, since the dessert also had a peach at room temperature, this supposedly warmed the ice cream enough for it not to be harmful and the dessert was enjoyed by all the guests, Nellie included. Pour into a chilled glass, top with whipped cream and drizzle on the Chambord. Add the peach slice and a few raspberries on the whipped cream, sprinkle on the sliced almonds and serve.